Angela Davis is a Black activist, scholar and writer born in 1944. 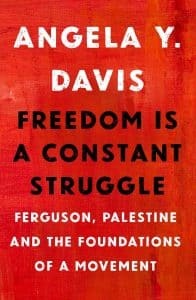 In “Freedom is a Constant Struggle”, she underlines the connections between struggles against state violence and oppression throughout history and around the world. – To open up the discursive terrain, Angela Davis develops a vocabulary that permits her audience to have insightful conversations about social issues. – To join a cause. In fact, the book shows that everything we experience as individuals always has political implications. When you popularize connections, you encourage people to think about struggles in a global way. This is why Angela Davies has always tried to create “windows and doors” between them. framework shows that movements are more powerful when they begin to affect the vision and perspective of those who do not necessarily associate themselves with those movements. Angela Davis reconnects Black movements history in the US with other movements that previously started in other countries, such as Cuba, China, and South Africa. Today, the ongoing struggle of the US black population can inspire Palestinians…and vice versa. In fact, what has kept Angela David going for all those years has been the development of new modes of community, across borders and beyond personal ambitions.